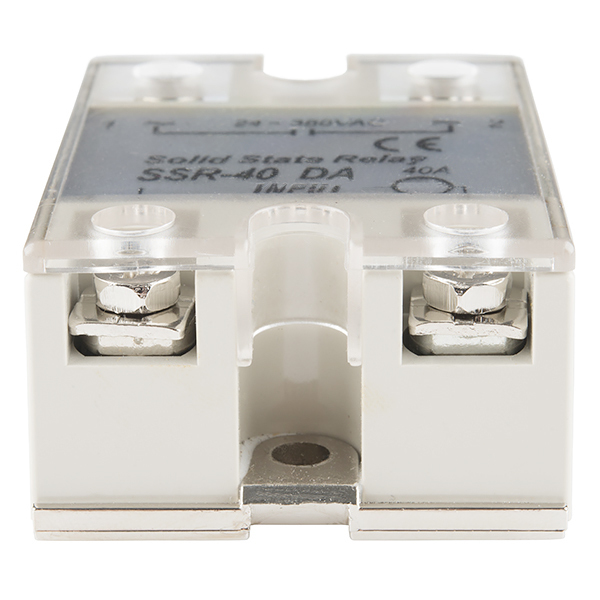 These solid state relays are controlled by a 3-32 DC signal on the input, but the output must be connected to AC. If you connect them to a load that's powered by DC current, you can turn the relay on, but you can not turn the load back off again without disconnecting power elsewhere from the load. ACZCPWM makes accurately controlling these possible (and easy). I have a glass kiln with temperature control within 0.1 degrees in 1000 degrees. Edit: Got ahead of myself there. The actual download link still points towards his GitHub repo, which is no longer present. Just a warning to any folks that are planning to purchase this: I've confirmed that this unit doesn't exactly work with 3V, as the datasheet suggests. It looks like the minimum reliable trigger voltage, without unintentional modulation, is around 4V. Of course, I discovered this a little later than I'd have liked to. TL;DR you cannot reliably trigger this with a 3.3V GPIO (it will be modulated or not trigger at all). Going to buy two of these tonight, also going to buy a thermocouple and thermocouple breakout. I am planning on designing a Photon controlled toaster oven reflow. Does the zero-cross trigger mean that a simple IO needs to be toggled in order to switch the SSR from on to off, or do I need to put a PWM signal that corresponds to the AC line? In that way also, could a PWM signal be used in order to vary the output load current? Thanks! I want to control a CFL using this relay. I have to control the same CFL in two modes, one is using an AC switch and the other is using this relay. That is, switch and relay should be connected in parallel like a LOGICAL OR GATE. If the switch or relay is on, CFL should turn on. My doubt is, when the switch turn on, AC terminals of relay get short circuited. Will this damage the relay or is there any chances for other damages ? The datasheet shows a leakage current of 3mA. Is that a typo? I thought leakage currents are usually in uA for good SSRs?? For switching mains power, this doesn't sound safe even if it's in the off position. 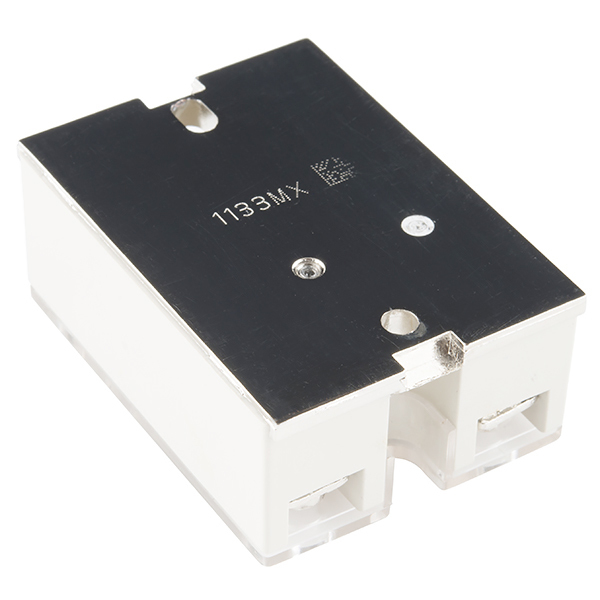 What would be the main difference between using this and say the KIT-10684 Solid State Relay Kit from SFE? https://www.sparkfun.com/products/10684 The kit is more than twice the cost, and this one does not require me to build it. Pros/Cons? The big difference is the current rating. The kit is rated for 8 amps this is 40 amps, although that requires a heat-sink. Really only tree pros I could see about the kit versus this: * The kit is substantially smaller. * The kit gives people opportunity to practice their soldering (yes, a bit of a stretch). * Heatsink is pretty much optional. You do not expect to run much with one this small, so you do not push it. The big relay you DO drive lots of power (I do at least since I have one of these from a prior source), so you need a nice size heatsink. Cons of the kit: * Expense. * Much lower overall Amperage it can handle. * Much more limited range on the control voltage. Sorry, could not get the formatting to work and gave up. Will this work to relay DC? I need a few for an automotive project, relaying 12V with 20 and 30 amp loads. I know that the coil versions are specific to AC but what about this one? Any word as to when these will be back in stock? Me and Mrs. Jonesing. It is not clear from either the datasheet nor from the SFE description whether this is an auto-zero-cross switching SSR, or if it is a phase-angle switching version? There are advantages and disadvantages either way, but we need to know which it is to properly identify what it is suitable for? Yes, I see that now. Thanks. I ordered 10 beefcake relay kits a while back. I should've waited for these I guess. Crap. Datasheet mentions 1.6v drop on the AC side at room temperature. At 40A load, that's 64 watt of power you need to dissipate via heat sink! The datasheet shows you the recommended heat sink for this product. I'd recommend basing your heat sink calculations on something higher - 100-150 watt so it doesn't get so hot and can rely on convection rather than needing a fan to cool. Your post implies you've used these before. For those curious about "failure modes", my experience is that when they fail (due to overheating), they fail in the "closed" (ON) position -- i.e. the triac shorts. I generally calculate the load current and multiply that by two, and then use a heat sink anyway. One thing I always look for, though, is the "zero cross" switch. That's particularly important if you're trying to control something like a hot plate, which invites a huge current surge when switched on as the input AC approaches a peak value. I'm using a similar relay to control the heat bed on my 3D printer I'm building. My heat bed is running on AC and the relay is in the primary of the step down transformer I'm using. My relay requires at least 12v to trigger so I had to use the RAMPS board mosfet controlled 12v output, using one of these I could have made use of any logic output. BTW is the heat sink tab isolated from the logic input ground (it BETTER be isolated from the power line!)? The type I've used (stone age vintage, but they look the same) in good working order had the heatsink (bottom metal plate) insulated from everything. The caveat to that, though, is if/when they fail due to overheating (see dnear1's post) is that you can't tell what's going to be connected to what after meltdown (literally for me, in one case several years ago). In that particular case, nothing in the controller circuit got damaged, but I did measure several megohms resistance between the control inputs and the AC inputs (and shorted AC output) after meltdown. I chalked it up to carbonized plastic. May or may not be worth keeping in mind for your circuit. If I wanted to control a normal 240V circuit, would I need two of these? Basically, there are 2 legs of 120V offset by 180Â°. Theoretically, it should work with just one, as there would be an open circuit unless the relay was closed. Also, is this NO or NC? It is NO. To control 240V, you would need two. If the load doesn't use the neutral, you could get away with one, but that would be against NEC and a safety hazard as the load would still be live with respect to ground or neutral when turned off. If you are in a country where one side of the 240V is ground-referenced, then you would only need one. Just one would do for controlling a 240vac device. after all as you say if either is disconnected its an open circuit and thus not working. out of the datasheet i read its Off below 1v input and On when above 2.4v (so NO). Remember to always read the datasheet when uncertain. in its parameters and connection diagrams your questions may already been answered. Every SSR that I've found online at this current level ( for a reflow oven ) requires a heat sink. There's no mention of a heatsink being required in the description. If you're putting 40A into it, yes, you will need a heatsink. I've found that using one of these with ~4-10A of current will cause the relay to get pretty warm, but simply bolting it to a piece of metal helps tremendously, as the whole bottom plate is metal. If using for intermittent use (pump, fan, etc), you could probably get away with open air. I've used a few of these with PID controllers to switch heating elements (in a sous vide cooker, and an espresso machine, both 120 V AC) -- it handles lots of AC current, silently; even with high loads, the SSR doesn't get very warm. My sous vide cooker is about 1200W, and when the full load is going through the SSR as it initially brings things up to temp, it still isn't hot to the touch. It's easy to put a radiator on the back - there's a nice metal plate, just add a couple mounting screws and some thermal paste - but I haven't needed to do so. The input is easy to switch with an Arduino or other 5V microcontroller output, to control e.g. heaters, pumps, lights. The indicator LED is useful to check that the SSR is getting the control signal. The screw terminals work nicely with either bare wire or spade connecters. The one I have in my espresso machine is inside the machine's case, and routinely sees 220 deg F; the heat so far has not affected functionality at all. This is a robust device, at a good price. Running two relays with only 11amps at 240V, these relays (2 of them) had the sides of the housing slightly melted and literally burned black rectangles into the plywood piece they were bolted to. So whoever said you don't need a heat sink in the other reviews...think again! Buy a version with a brand name, like Omega and follow their instructions, which say to use a sink. Or at least bolt them to an alum plate. If i could post a pic here of the burnt wood and melted housings, I would. Sorry to hear you've had trouble with the solid state relay. I don't know who told you that a heatsink wasn't required, but they were incorrect. Any solid state relay that's controlling more than a few watts will need a heatsink. I will be using these for all my AC voltage projects. I used an Arduino Nano with one of these to build a cycle timer. This unit is sturdy and built really well. Mounting is easy and the terminals are full size so you can simply split right off the power cord very easily with the peace of mind that the connections will remain solid. I've used this with 5V DC from Arduino to switch on/off a light at 240 VAC and (separately) an irrigation system at around 30 VAC. I like the heat sink and plastic cover for safety. Also easy to wire up. I originally bought another very similar SSR, also rated for 3~32VDC on the control side. However, it wouldn't actually activate from the 3.3v digital pins on my Arduino. It needed closer to 5v to activate. So, I ordered this one. It worked perfectly as soon as I wired it up. Now I can digitally control my brewing mash temps! Hooray! Picked up several of these when I was planning my home automation system. What I liked was that it was able to work with the raspberry pi at 3.3v without a problem. a lot of the other relays i looked at needed 5v for input. with this one I was able to connect it to a GPIO pin and when that pin went high the relay turned on. no muss no fuss. I have sence switched to esp8266 modules and it works with them as well. Did not cause unnecessary troubles. We bought 35 pieces but haven't had a chance yet to put them to work. However, your handling of our order and shipping was 5 star! I needed an easy way to disconnect RV power after I had already climbed into my bunk. This unit combined with a micro switch is a perfect solution! Bought this relay to control an espresso machine heating element. I was concerned about heat because I mounted the relay inside he machine, but I have had no problems. I also really like the design and quality of construction. Couldnât ask for better. Was able to switch mains AC power with an Arduino UNO using PWM. Worked perfectly for what I needed. I have used the relay extensively for two weeks now and have had no issues. I am switching two legs of 240 volt AC for a well pump. I am using the relays so the pressure switch contacts will last longer. As I said, so far so good. I have the relays mounted on a heat sink appropriate for 15 watt heat dissipation. 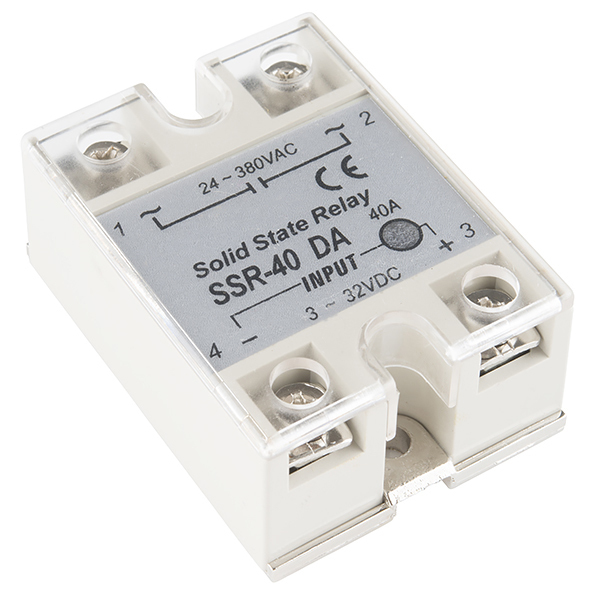 For safety reasons, remember almost all solid state relays have some leakage current when in the off state. The relays are a good value and work well. Like all SSR's don't run them at the rated current, they will get hot and sometimes not shut off. Mine are running at less then 20amps and work very nicely. This relay is the switch between an arduino and a space heater. Been using it a couple weeks now, and it is functioning perfectly. I had a couple of the $US5 "Fotek" fakes I got off Ebay. Although they didn't burn up they failed on for my application in hours or days. They failed in the "on" state which was disconcerting. I ordered one of these as a trial and so far is operating fine after several months of continuous use and a year later. The application is a cheap PID temperature controller maintaining a water tank temperature as part of a hydronic heating system. The SSR is installed with a heat sink and some attention to the instructions. The load being switched is a 4800W immersion heater at 240V. So far so good. After a year of use I figured it was safe to offer some feedback as most folks are running << the rated current/power of the device I find. Good price for this item! Our MakerSpace has a classroom where the only light switch is at the opposite end of the room from the entry. As it would not be easy or inexpensive to re-wire the lighting and it is a MakerSpace, I decided to fabricate an IOT solution using a pair of Particle Photons, this SSR and a NO push button. This relay works as advertised, is completely silent and runs cool to the touch. The 3.3VDC output from the Photon activates the relay every time and the Particle cloud is easy to use and monitor. For remote switching of non-trivial AC applications, this relay can't be beat. Perfect for my application at a reasonable price! Wired this into an outlet box to turn on outlets using the 12V trigger from my surround sound receiver. This way my subwoofer would turn on and off with the receiver using a Crown Power Base 2 amplifier. A nice solid state relay. Mind the leakage current, if that sort of thing matters to your project. I've hooked these up to Raspberry PIs and ESP8266's no problem. Connecting it to an ESP8266, and a HDT22, I was easily able to make my own 'Nest' device to control the power to my AC unit for about a year now. It works well, and is silent. with the sealed design and high amperage capability, I am purchasing more of them to add control over my baseboard heaters next! Just make sure to have a DC power supply hooked up to the Arduino and it works great. If you try to run 2 off the Arduino with only the USB it can't quite power them. Been using it with 120v 60hz and now 50hz without issues.